Heat conductive rubber pads are used to provide even heat to surfaces that might not be perfectly flat, and is our recommendation for imaging porcelain, stone and glass tile, glass cutting boards, and ornaments. Green silicon rubber pads are most commonly used in pressing to porcelain and glass. The 1/16" thickness is recommended for jewelry and porcelain ornaments. 1/8" is perfect for glass cutting boards, tiles and plaques. The red rubber is a stretchy material that can be used to rehabilitate a dye wrap or create a cusom wrap for an odd shaped item. Dimensions: 1" x 40" x .125"
Heat Conductive Green Rubber Pad, (1" linear) 1" x 40" x .125". This is sold by the linear inch x 40", so order to fit your needs. Heat Conductive Green Rubber Pad - 1/8" Thick - 7" x 7"
Dimensions: 7" x 7" x .125"
7" x 7" x .125" 1/8" Heat Conductive Green Rubber Pad for 6" Tiles. 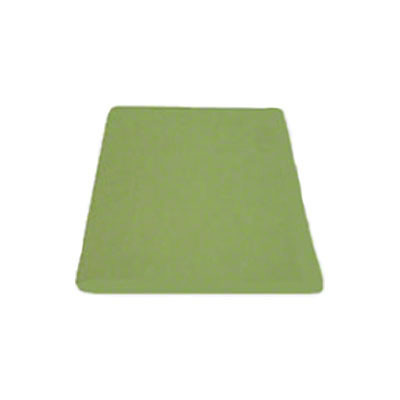 Heat Conductive Green Rubber Pad - 1/8" Thick - 6" x 8"
Heat Conductive Green Rubber Pad; 6" x 8" x 1/8" (.125"). These pads are buffers between the heat of the press and vulnerable areas of substrates. Heat Conductive Green Rubber Pad - 1/8" Thick - 6" x 10.25"
Dimensions: 6" x 10.25" x .125"
Heat Conductive Rubber, Green, 6" x 10.25" x .125". This rubber pad is used with the Stainless Steel Water Bottles. Heat Conductive Green Rubber Pad - 1/8" Thick - 5" x 5"
Dimensions: 5" x 5" x .125"
Heat Conductive Green Rubber Pad; 5" x 5" x 1/8" (.125"). Great pad for pressing 4x4 ceramic or glass tiles. Heat Conductive Green Rubber Pad - 1/8" Thick - 5" x 10"
Dimensions: 5" x 10" x .125"
Heat Conductive Green Rubber Pad, 5"x10"x.125". If used as a DK3 replacement pad, contact George Knight directly for sales and support. heatpress.com or 1.800.525.6766. You will also need FAC-SILC3 adhesive, sold separately. Heat Conductive Green Rubber Pad - 1/8" Thick - 4" x 7"
Dimensions: 4" x 7"x .125"
Heat Conductive Green Rubber Pad - 1/8" Thick - 16" x 20"
Dimensions: 16" x 20" x .125"
Heat Conductive Green Rubber Pad; 16" x 20" x 1/8" (.125"). Use these pads to buffer breakable tiles and protect them from cracking. Heat Conductive Green Rubber Pad - 1/8" Thick - 15" x 15"
Dimensions: 15" x 15" x .125"
Heat Conductive Green Rubber Pad; 15" x 15" x 1/8" thick.(.125"). Heat Conductive Green Rubber Pad - 1/8" Thick - 14" x 16"
Dimensions: 14" x 16" x .125"
Heat Conductive Green Rubber Pad; 14" x 16" x 1/8" (.125"). A perfect pad for using the DK16 or JP14 and pressing glass substrates. Heat Conductive Green Rubber Pad - 1/8" Thick - 3" x 12"
Dimensions: 12" x 3.5" x .125"
Green Heat Conductive Green Rubber Pad; 12" x 3.5" x .125". This pad is long and thin, be sure it will fit your project. Heat Conductive Green Rubber Pad - 1/8" Thick - 12" x 14"
Dimensions: 12" x 14" x .125"
Heat Conductive Rubber Pad; 12" x 14" x 1/8" (.125"). Green silicone rubber pads are most commonly used in pressing to porcelain and glass. Dimensions: 1" x 36" x .125"
Heat Conductive Green Rubber Pad; 1" x 36" x 1/8" (.125"). This is sold by the linear inch, so order it as needed x yard. A thicker pad is more protective and better for breakable, like glass. Heat Conductive Green Rubber Pad - 1/16" Thick - 7" x 7"
Dimensions: 7" x 7" x .0625"
Heat Conductive Green Rubber Pad; 7" x 7" x 1/16" (.0625"). These pads are required accessories. This one is fitted for pressing porcelain plates. Heat Conductive Green Rubber Pad - 1/16" Thick - 6" x 10"
Dimensions: 6" x 10" x 1/16"
Heat Conductive Green Rubber Pad, 6" x 10" x 1/16" (.0625"). Heat conductive rubber pads are used to provide even heat to surfaces that might not be perfectly flat. Heat Conductive Green Rubber Pad - 1/16" Thick - 3" x 5"
Dimensions: 3" x 5" x .0625"
Heat Conductive Rubber Pad; 3" x 5" x 1/16" (.0625"). These pads are required accessories. You will need several, this is a good size for the JP14 or any bigger press. For very small 2" tiles. Heat Conductive Green Rubber Pad - 1/16" Thick - 16" x 20"
Dimensions: 20" x 16" x .0625"
Heat Conductive Rubber Pad; 20" x 16" x 1/16"(.0625"). If you have a DK16 or bigger press, you will need this size pad. Heat Conductive Green Rubber Pad - 1/16" Thick - 14" x 16"
Dimensions: 14" x 16" x .0625"
Heat Conductive Rubber Pad; 14" x 16" x 1/16" (.0625"). These pads are required accessories. You will need several, this is a good size for the JP14 or any bigger press. Or buy this one and cut into smaller pads as needed. Heat Conductive Green Rubber Pad - 1/16" Thick - 12" x 14"
Dimensions: 12" x 14" x .0625"
Heat Conductive Green Rubber Pad, 12" x 14" x 1/16" (.0625"). Heat conductive rubber pads are used to provide even heat to surfaces that might not be perfectly flat. 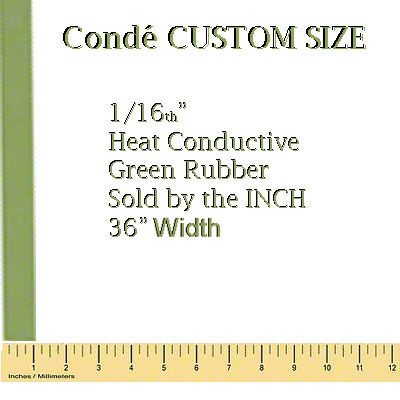 Dimensions: 1" x 36" x .0625"
Heat Conductive Green Rubber Pad, (1" linear) 1" x 36" x 1/16". This is sold by the linear inch x yard, so order to fit your needs.